We were fortunate enough at my library to purchase a new table for our early literacy center. Our old table had a permanent puppet stage attached to it. While kids love to put on a puppet show, they had grown pretty tired of it after a year. If you are building your early literacy space-- don't make anything permanent! Unless you're absolutely positive you will always want to have X in a certain spot, don't lock yourself in. It is much easier when you have some flexibility with the furniture. We have already made the decision to not make anything permanent on our new table. Instead we will change out the activity monthly. This will encourage our little ones to keep visiting the center and hopefully give the parents new tips each time they visit. This month I decided to make two I-Spy Bottles. These are super easy to make and some examples can be found here, here, or here. Since we are a very public space, I decided to use plastic Powerade bottles. They are thicker than regular water bottles, but not so thick that a little kid can't pick it up. I also hot glued and taped the lid, just in case. Finally, because I'm a little neurotic, I made the rice with vinegar instead of rubbing alcohol. Worst case scenario- if rice does end up in a little one's mouth there is nothing toxic to worry about. I decided to make one bottle all about colors. I included different colors of buttons and pom-poms. This makes it easy for the young ones to point out and talk about what they see. 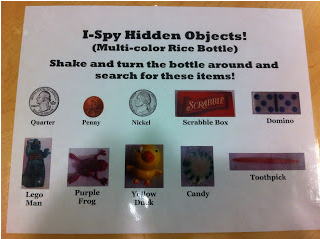 I put different objects in the second bottle for the preschoolers to interact with. I also made a sign for each bottle describing the activity. 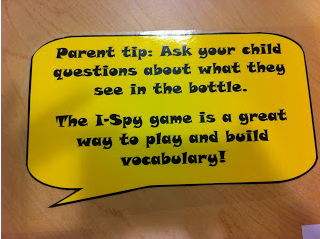 And of course, an early literacy center activity wouldn't be complete without a parent tip! 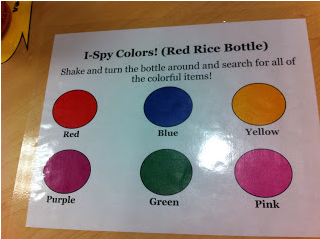 Do you change the activities in your early literacy center? Johnny is ready for a very boring summer in Vermont. He's about to enter high school and is preparing himself for a lot of gaming, sleeping, and eating. All of those plans come to a screeching halt when Johnny's mother informs him he has to go live with his cousin and aunt for the ENTIRE summer. Johnny is a little excited though. His aunt works at the local 7-11 and gives him free slushies whenever he wants. The summer is starting to look pretty promising. Then, his mom drops the bomb. He has a JOB! He has to basically babysit his older cousin, Remember, while his aunt is at work every day. Remember is not your normal 15 year old boy. As Johnny describes him, "He's what polite people call different. I call him weird. He doesn't have friends. He looks the wrong way when you speak to him. He either talks a mile a minute or not at all. He's stubborn and high-strung. I could go on and on." Is this going to be the worst summer of Johnny's life? I really enjoyed this book. 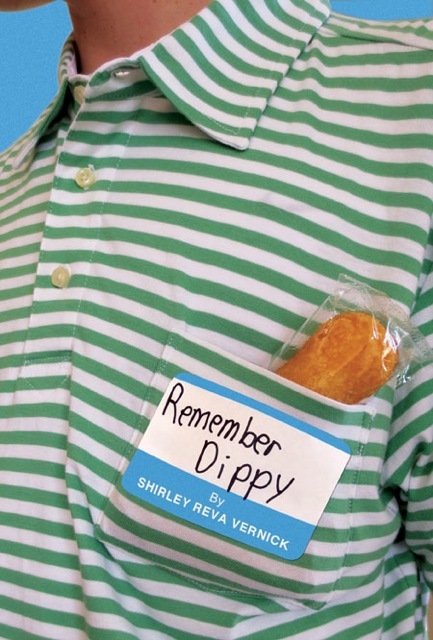 It is a subject that has been touched on by many, but never quite as well as Shirley Vernick portrays it. Johnny is an average 13 year old boy. He's selfish, in love with a girl, and doesn't want to be stuck with his weird cousin all summer. Johnny is also a character that is easy to relate to. His love for his family shows on every page, even the ones where they are arguing with each other. This book has plenty of angles to keep middle grade readers intrigued. There is some mystery involving a lost engagement ring, romance involving a best friend's sister, and bullying from the neighbor next door. However, the overall theme in this book is friendship. By the end of this book, you'll be yelling at Johnny to make the right decisions, yelling at Remember to hold it together, and you will absolutely love how much the characters have developed throughout this book. This is a wonderful book that I would recommend to anyone that came in asking for a good summer read. Fans of books such as Wonder by R.J. Palacio, Out of My Mind by Sharon Draper, or The Strange Case of Origami Yoda by Tom Angleberger will love this addition to your library shelves. For more readalikes for this book, check out The Show Me Librarian's wonderful recommendations. 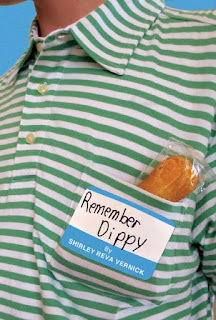 Remember Dippy by Shirley Reva Vernick is available June 11, 2013. I am so happy to be part of this wonderful book tour promoting Start With a Book! This is a fabulous website full of information for caregivers, librarians, and teachers. Seriously, go check it out. As a librarian who does storytime on a regular basis, it can be difficult to come up with new literacy tips each week. I have a lot of children who are repeats in my session, so I might see one family for 4 separate session in a year. I like to keep things as exciting as possible for them and don't want them to hear the same information each session. This is where a website like Start With a Book comes in handy. This website has a huge amount of information about early literacy. If you are looking specifically for tips to share with your parents during storytime, then the Reading Aloud section is a great place to start. This section includes links to its parent site Reading Rockets, and some wonderful handouts. Things like "Reading Tips For Parents" gets further broken down into parents of babies, toddlers, preschoolers, etc. This would be a wonderful handout to give to caregivers during your storytime session. There is also a section where you can sign up to receive a reading tip every day! They are perfect short and quick tips that you can share with parents or put on your monthly library calendars. These tips are also available in Spanish. Plus, they come to your cell phone. It really can't get any easier. So whether you're struggling coming up with new literacy tips for parents, or you just want to have more resources available to your parents--this is a great site to go visit. To check out what some other librarians are doing with this site go visit Amy at Show Me Librarian for the tour schedule. Also, don't forget to enter to win a bundle of fantastic books!